School’s out for Christmas! And we’re all looking for some festive fun that doesn’t break the bank! We’ve compiled our top places to do with your family this Christmas holiday! If you’re in Covent Garden catching the sales, why not visit the London Transport Museum and enjoy their Christmas holidays family fun event. Take part in family friendly parachute games and follow a snowflake on its journey from the sky to the streets of London. With these create and craft activities, get hands on and with junk modelling and let the kids create their very own mini snow mobile. Don’t forget the LEGO Snow Globe featuring 120,000 LEGO bricks. It took Duncan Titmarsh, the UK’s only Certified LEGO Professional, 75 days to build. London themed, it features some of London’s most iconic building including The Shard, Big Ben, Nelson’s Column and The London Eye. Press a magic button and watch in delight as the snow starts to fall on the LEGO scene. Cost: Entry to the Museum is £15 and your ticket is then valid for a year – children go free. All events are free once you’re in. Hidden amongst London are a wonderful array of nature reserves, towpath walks and green walkways waiting to be explored. The longest linear nature reserve Parkland Walk running from Alexandra Palace to Finsbury park is definitely worth a visit, a former railway line it’s a perfect place to meander with the kids on their new bikes. Another gem the Thames Path Walk is the main artery of London covering a magical 40 miles (64 km) of easy, level walking on both sides of the river from Hampton Court Palace, through the heart of London to the East India Dock on the north bank and the River Darent on the south bank. The Horniman Museum and Gardens is a wonderful place to take the family after the feasting and festing of Christmas. Enjoy a breathe of fresh air as you stroll or run around the gardens and enjoy a snack in the cafe. Refuelled and recharged – pop inside the museum and visit the aquarium, the music gallery and the Natural History Gallery. This December there is a unique chance to see a selection of paintings and sculpture from British artist Kurt Jackson’s different river projects, including the River Thames, from the last three decades. Cost: Entrance to the Museum and Gardens is free. A charge is made for the Aquarium. Light up the Night and be inspired by the glittering gold you can find in the paintings at The National Gallery. Artists Karly Allen and Gayna Pelham will show you how to create a celebratory paper lantern to take home or add to a twinkling lamplight display with this drop in family event . Based on the classic Tim Burton movie and featuring the beautiful music of Danny Elfman and Terry Davies, Matthew Bourne’s Edward Scissorhands touching and witty love story tells the bittersweet tale of a boy left alone and unfinished in a strange new world. Revitalised for a whole new generation of dance lovers and theatregoers, Bourne takes a fresh new look at this modern fairytale. This magical dance production is wonderful; energetic, funny, sad and enchanting – and it snows at the end! Enjoy a swim with a difference and head to Hampton Lido. Open 365 days of the year, this heated pool is warm whatever the weather. And if it’s ‘cold outside’ baby, the pool takes on an ethereal look as a wonderful mist rises out of the warm waters. There’s a cafe for hot drinks and snacks after and if you’ve driven, then you’re only a short drive from Hampton Court. You can enjoy the ambience of Hampton Court and the cafe there without paying to enter and there’s an ice rink to – open til 4th January. 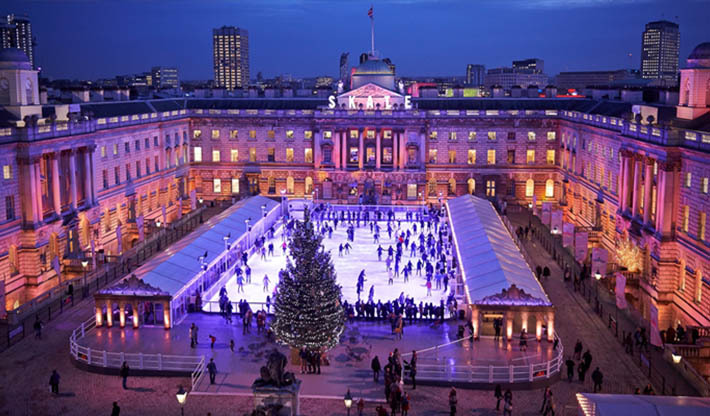 Celebrate the festive season in style at London’s most beautiful ice rink. Enjoy a day time skate and check out the new Polar Bear stabilisers (there’s even a polar bear club for young children) or book for when the sun goes down and you might be able to squeeze in some apres-skate with a naughty cocktail or indulgent fondue; hot choc’s for the kids. This year Somerset House have partnered with Fortnum and Mason’s and as well as Fortnum’s Lodge (offering tasty pastries, welsh rabbit and other delights), there is a Christmas Arcade – 15 elegant rooms will be dedicated to showcasing Fortnum’s festive favourites – it’s like a Fortnum and Mason’s mini me. Stream walking in the Isabella Plantation – don your wellie boots, fill that flask with hot chocolate and discover the botanical beauty of the Isabella Plantation in Richmond Park. A perfect place to enjoy a magical day outdoors after the indulgence of Christmas – imagine other worlds as you walk through the streams and garden, it is a true paradise for little people. Journey to the British Library for this new exhibition entitled: Lines in the Ice: Seeking the Northwest Passage. It examines why Europeans are drawn to explore the Arctic and, in particular, the fabled Northwest Passage. The exhibition displays early European maps of the Arctic, Inuit accounts of the coming of the explorers, writings from the search for Franklin, early Arctic photography and much more. It also unearths the history of the North Pole’s most famous resident – Santa. A stone’s throw from One Granary Square – pop and see the fountains; spectacular day and night! Winter Wonderland in Hyde Park returns this year – more wondrous and wintrier than ever before with treats galore for all the family! With rides for all ages, a Christmas Market, ice-skating, The Magical Ice Kingdom, Zippos Circus and the Giant Observation Wheel – you’ll be spoilt for choice! Enjoy our LittleBird top tips for visiting with your family this year on our blog.